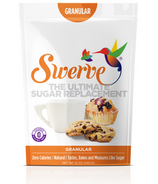 Swerve is a great tasting, natural sweetener that measures cup-for-cup just like sugar! Made from a unique combination of ingredients derived from fruits and vegetables, Swerve contains no artificial ingredients, preservatives or flavours. 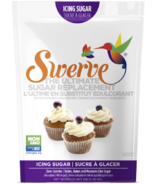 As a replacement for sugar, Swerve is zero-calorie, non-glycemic and safe for those living with diabetes. Human tests have shown Swerve does not affect blood glucose or insulin levels. Swerve has no bitter aftertaste associated with other natural sweeteners and unlike other sugar alcohols there is no digestive intolerance (no laxative effect).